Even though they were not related in a family or triad, Thoth and Maat were often considered jointly, and together they provide us with valuable insights into Egyptian mythology. Both represented qualities of the intellect (wisdom and truth), but there were major differences in the ways the two were though of. Maat-truth and justice was not nearly as well developed myth-logically (that is, as a character in stories) as was Thoth wisdom. The former, a feminine personification, was ethereal and abstract whereas the latter was depicted in concrete and specific images. The view of Maat was philosophical and theoretical while the concept of Thoth was personal and practical. The contrasts, however, should not be taken too far: Thoth, however personal and visual his representation, did represent an important intellectual concept, and Maat, however abstract her qualities, was depicted as a concrete figure who was at times involved in the myths of other gods. Both god and goddess represented human and divine qualities necessary for a satisfactory life and for passage through the underworld. They were placed as a pair in the solar boat to set its course, providing guidance for Ra and his companions during their passage through the sky. Even though they had important roles in the mythologies of Memphis, Heliopolis, and Thebes, Thoth and Maat were not normally made close “blood” relatives of the divine families in those cities. When the priests there created family trees for their gods, these two were placed out on a limb. They did, though, important supporting roles in the stories evolved at the major c centers. Thoth, in particular, figured in many myths from the Delta to the far south and was called at one time “the mightiest of the gods,” for reasons that we shall see. His own cult center, Hermopolis, was not dominant politically and this may explain why its mythology remained local and why Thoth never became chief god of all Egypt. In stories from around Egypt, we have uncovered numerous versions of the creation of the world and of the gods and humans who populate it, but one of the most unusual and interesting came from the unlikely village of Hermopolis, a town of no political importance. Thoth’s cult center was in this small town in Middle Egypt near the present city of Minia. 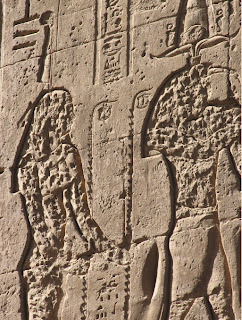 Priests there espoused a mythology at an early date, and evidence of its influence can be found in the Pyramid Texts. No surviving document or monument sets it out as a system; most references to Hermopolis occur in documents late enough to show influence from the more politically important religious centers. The outline of the original Hermopolitan mythology, nevertheless, can be discovered, and is now thought to be a mythical explanation of the ebbing of the Nile flood, which left behind it mounds of earth teeming with life. While other versions of the creation tended to tell stories of distinct events involving gods with distinct characters, the view of creation at Hermopolis was more abstract, though not entirely so. This mythology described the work of four elements that arose from the chaos and gave shape to it. The elements were given names, but not the elaborate personalities of Ra, Ptah, and Atum, the major gods in other creation myths. Even the characteristics that the elements represented were abstract. Who come out of the City of Eight? You who are not yet illuminated by the sun. The poem tells how, on the Island of Flame, the primeval hill similar to one on which Ra arose, the four gods came into being at the same time; they were seen as some sort of force that existed between heaven and earth. At first there were four male elements and an unnamed leader (the “Five Great Gods”), but once Thoth developed a national role, he was thought of as leader and this became his creation story. Each element brought with him his female component, giving the total of eight elements. 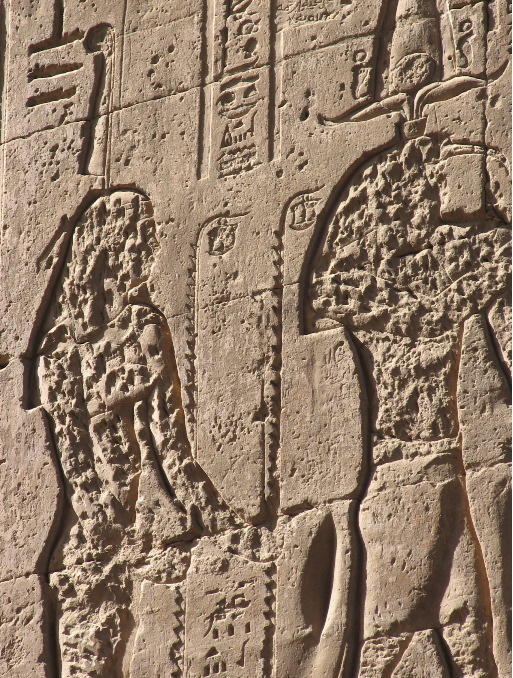 The group included Nun, the god of the primeval ocean already seen in the mythology of Heliopolis, and his consort Nunet; Heh, the god of the immeasurable, who with his consort, Heket, was responsible for raising the sun; Kek, the god of darkness, and his consort, Keket, gave the world the darkness of night so that the sun would have a place to shine; and Amun, the god of mystery, the hidden, and nothingness, who with his consort, Amunet, brought the air that breathed life into everything. The four males were depicted as frogs and the females as serpents swimming around in the mud and slime of chaos, the primeval nothingness from which everything sprang. The Pyramid Texts said that “the Waters spoke to Infinity, Nothingness, Nowhere, and Darkness”-meaning that Nun spoke to his four male companions, and the creation began. Eventually the eight elements came together and out of their union came the primeval egg that could not be seen because it existed before there was light. Out of the egg came the light of the sun, which the eight raised up into the sky.